The Taken King employs a clever progression system for Light Score which makes it impossible to leap straight to the highest levels as was possible in other DLC. This time, players need to carefully ascend the light ladder to the maximum level. In this post I'll explain the best way to do this and hopefully provide a clearer picture for the end-game Light calculation. Important: one of the crucial rules is to ensure that you equip your highest Light gear before decoding any engrams or packages. All new rewards are calculated based on your current score; whether you like those weapons and armour or not is irrelevant, just make sure they're equipped beforehand. The new maximum Light score in The Taken King is 300 (outside of the Raid); taken as the average Light across all of your equipped gear (both weapons and armour). Simply add up the Light for all your gear and divide by 9 (4 weapons and 5 armour) to reach your Light Score. Take note that the final value is rounded up, which also comes into play later as well. As you progress closer to 300, small changes in your gear will only push you an inch closer to your goal. So even though you start by increasing your Light fairly quickly, it gradually slows down with the final 10 or so required to reach 300 being the most painful. Reaching the maximum level of 300 (without Raid items) requires that you obtain a 300 Light item in every inventory slot. In the beginning, gaining Light is simply a case of finding Blue or Purple engrams and decoding these from the Cyptarch for the corresponding armour piece. The new piece is calculated based on your current stats. It's therefore a good tactic to exchange an engram and equip the new piece before exchange the next one - thus helping you ascend more quickly. As soon as you get gear with a higher Light value, immediately equip it and dismantle the older piece. I strongly suggest you avoid buying any gear for now. Blues will flood in during the pre 260 light phase and it's not worth worrying about a Legendary just yet. Instead, it's far more important to save the marks for later and then buy into an area where you lack Light (usually the Ghost shell). Although there's a certain temptation to Infuse your Legendary gear, avoid this for now. You'll find that Blue gear can easily outrank purples quite quickly at this stage, and you should concentrate on grinding more blues instead. The only time to break this rule is if you find a 270+ Legendary (which will be very rare considering your current Light Score). Other Legendary items can either be kept to the side or dismantled for 3 Legendary Marks (or 5 of you level up the gear first using Motes). For now, concentrate on Blue engrams. These are your regular path to slowly increase light. The reliable (and less frustrating) way to earn new Blue engrams is to continuously play the Level 36 Strike playlist ("Vanguard Strikes"). The rewards don't include a guaranteed Legendary engram but don't let that put you off - it's far more important to grind out the blues early in the game. You'll also get less frustrated rather than attempting a heroic strike which is well out of your league. As your collection of Blue engrams increases, head back to the Cryptarch on a regular basis to exchange engrams and top up your Light Score. This will help you attain higher value gear the next time you play the strikes. Simply repeat this Blue farming process for about 3-4 hours until you reach a Light Score of 260. Once you reach 260, it's time to venture into the Heroic Playlist for guaranteed Legendary engrams and Legendary Marks. These are capped on a weekly basis but you'll still get a heap of blues along the way too. 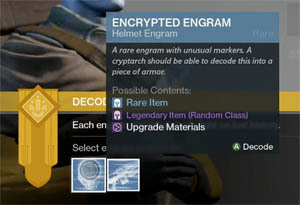 Also keep your eye out for Xur at the weekend. Purchasing new exotic items, even if you don't want them or they're not your class, will allow you to Infuse your way up the ladder fairly quickly. All Year 2 exotic weapons and armour will have a Light stat of 280. If you find things are slowing down, make a judgement call and consider switching back to the Level 36 strikes or even bail out of a "sticky" strike altogether. The key at this stage is efficiency, so if something's taking too long then switch it up. Repeat this process for about 3-4 hours until you reach a Light Score of 270-280. Now the fun really begins and it's time to consider Infusing items to increase their Light Score. Hopefully you should have gained a nice collection of Legendary weapons and armour that you're happy with? Good perks, stats etc..
You should also have a stack of marks at your disposal to start Infusing gear? 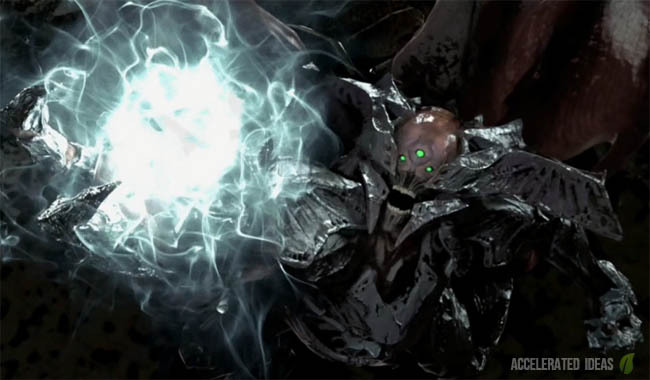 My advice at this stage is to continue playing the Heroic Playlist but also mix in Court of Oryx at the Dreadnaught. The high level bosses from Court of Oryx are a quick and dirty way to get good loot - which can easily include multiple blues and the odd purple engram. Get yourself a stash of Runes and a good Fireteam to farm the hell of of the Court for a faster method of boss loot. Many more blue engrams will drop and the Light Score of these engrams will even surpass the 290 mark on occasion (I've seen a few rare 295's). Take these high ranking Blue's and Infuse them into your preferred Purple gear at the cost of 3 marks. Slowly and surely you'll drift towards that 300 mark. The Infuse process only preserves about 80% of the difference in Light Score, but this is the only way to increase Purple gear vs equipping Blues. As you approach the higher scores e.g. 290+ the Infuse method will only notch up the gear by a single value or two, but take note of the rounding up which works in your favour. It's a slow process towards the end but stick at it and you'll creep each of your items towards the 300 mark, thus improving your overall Light Score. Until the Raid becomes an option, this is your preferred route to 300.